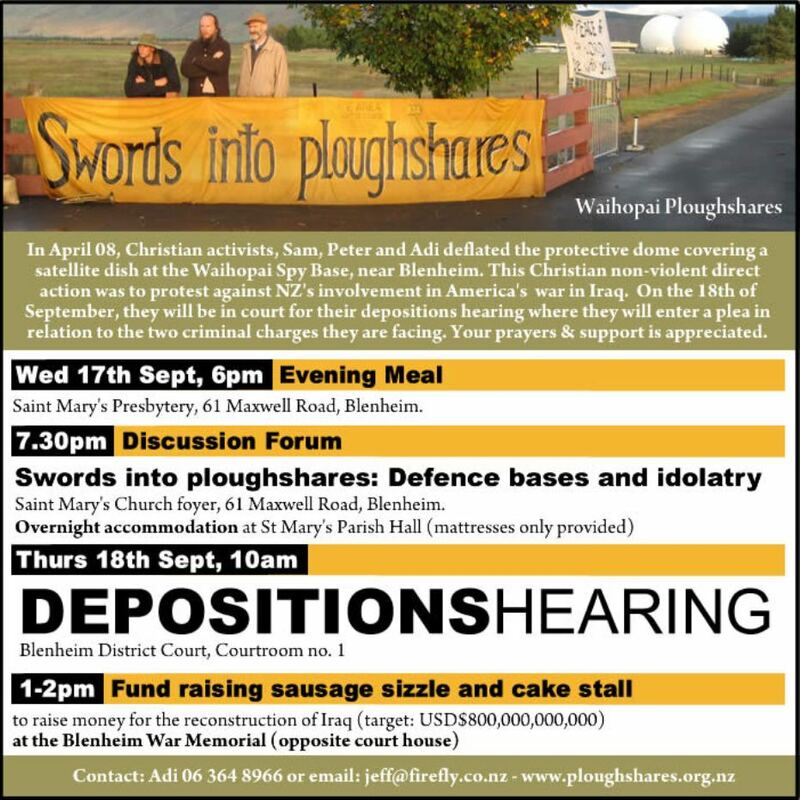 This page has the details of how you can support Waihopai Ploughshares around their depositions hearing which will be held at Blenheim District Court on Thursday, 18 September. There are four sections below: what's happening in Blenheim on 17 and 18 September, supporting events in Wellington and Auckland on 18 September, and other ways you can support Ploughshares. "On 30 April, Christian activists Sam, Peter and Adi deflated the protective dome covering a satellite dish at the Waihopai spy base near Blenheim. This Christian non-violent direct action was to protest against NZ's involvement in America's war in Iraq. On the 18th of September, they will be in court for their depositions hearing where they will enter a plea in relation to the two criminal charges they are facing. Your prayers and support are appreciated." On Thursday, 18 September * 10am - depositions hearing, Courtroom No 1, Blenheim District Court, 58 Alfred Street * 1pm to 2pm - sausage sizzle and cake stall to raise money for the reconstruction of Iraq (target:USD$800,000,000,000) at the Blenheim War Memorial, opposite the court house. A printable poster with the Blenheim events is available here, for more information contact Adi, tel 06 364 8966 or email. From 1pm to 2.30pm - peaceful presence at the GCSB HQ, Freyberg Building, corner Aitken Street and Mulgrave Street (opposite Archives NZ), with music, and more! All welcome, come along and support Ploughshares non-violent / faith-based kaupapa; for more information contact the Wellington Ploughshares Support Group. From 12.30pm to 2pm - peaceful presence outside the US Consulate, Citibank Building, 23 Customs Street East (corner of Commerce Street). All welcome! come along and support Ploughshares non-violent / faith-based kaupapa, for more information contact the Auckland Ploughshares Support Group. Prayer, advocacy and money are all important ways that supporters can participate in the witness of Ploughshares. Ploughshares support information - including a request for prayers / karakia, how to post messages of support or join the Ploughshares mailing list, and suggestions for questions you can ask the Prime Minister about Waihopai - are available on the Ploughshares web site or by email. this flyer, with information about Ploughshares and Waihopai (print 2, copy as double sided A4, cut to A5).